A locally made vodka called South Fork is making its debut — the latest sign of the boom in craft distilleries. Others in our region include California Distilled Spirits in Auburn and Dry Diggins Distillery in El Dorado Hills, among others. “South Fork Vodka is an elegant hand crafted vodka, distilled six times from American corn, and produced in small batches here in Grass Valley,” according to its owners. “I suspect by now you’re all aware that my buddy (Jon Dorfman) and I started a business, with the goal of creating small batch, craft spirits in Nevada County. I’m very happy to tell you that after the last eight months of work, we have a product that’s ready to hit the market, and it’s one I’m proud of. We’ve created a Facebook page and an Instagram page so you can keep up with what we’re up to,” writes Dan Kennerson on his Facebook page. 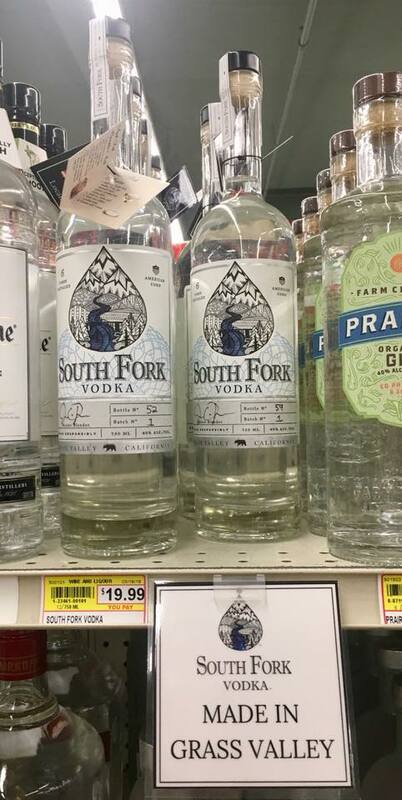 South Fork Vodka is currently available at SPD Nevada City and Grass Valley, Tofanelli’s, Cirino’s, Golden Era Louge, Lefty’s Grill, Wild Eye Pub, Stone House and other locations, according to the distillery. It also is going to be available at the Draft Horse Classic at the Nevada County Fairgrounds on September 21-23, paired with Cirino’s popular Bloody Mary mix. South Fork Vodka is holding a launch party at Golden Era on Sunday, September 23. The parent Satellite Spirits plans other distilled spirits in the future, but South Fork Vodka will be the flagship product, the owners said. Tonight KVMR featured the startup on its News Hour: http://www.kvmr.org/podcasts/kvmr-evening-news-thursday-september-20-2018 Paul Emery did a good job with the interview, but it mistakenly misspelled Dorfman’s first name on the written summary; it’s Jon, not John. Kudos to this business and to Paul and KVMR for the feature! Now The Union has the story, but it also misspelled Dorfman’s first name. https://www.theunion.com/news/local-news/thats-the-spirit-nevada-countys-first-locally-crafted-spirits-make-their-debut/ Still a good read.